The Mongolian Death Worm, known to Mongolia�s nomadic tribesmen as the allghoi khorkhoi (sometimes given as allerghoi horhai or olgoj chorchoj) or �intestine worm� for its resemblance to a sort of living cow�s intestine. It is said to be red in colour, and is sometimes described as having darker spots or blotches, and sometimes said to bear spiked projections at both ends. They are said to be thick bodied and between 2 and 5 feet long. "Sausage-like worm over half a metre (20 inches) long, and thick as a man�s arm, resembling the intestine of cattle. Its tail is short, as [if] it were cut off, but not tapered. It is difficult to tell its head from its tail because it has no visible eyes, nostrils or mouth. Its colour is dark red, like blood or salami� It moves in odd ways � either it rolls around or squirms sideways, sweeping its way about. It lives in desolate sand dunes and in the hot valleys of the Gobi desert with saxaul plants underground. It is possible to see it only during the hottest months of the year, June and July; later it burrows into the sand and sleeps. It gets out on the ground mainly after the rain, when the ground is wet. It is dangerous, because it can kill people and animals instantly at a range of several metres." The creature is reported to be able to spray an acid like substance that causes death instantly. It is also claimed that this creature has the ability to kill from a distance with some sort of super charged electrical charge. Numerous Mongolians have reported seeing this creature including a Mongolian Premier. The creature is reported to hibernate during most of the year except for June and July when it becomes active. It is believed that touching any part of the worm will bring instant death, and its venom supposedly corrodes metal. Local folklore also tells of a predilection for the color yellow and local parasitic plants such as the Goyo. It is also believed that the worm likes to get out on the ground generally after the rain, when the ground is still wet. Could it be a kind of land electric eel? Electric Eels are long worm like creatures and it is known to science that electric eels can generate electric disharges powerful enough to disable or kill prey. 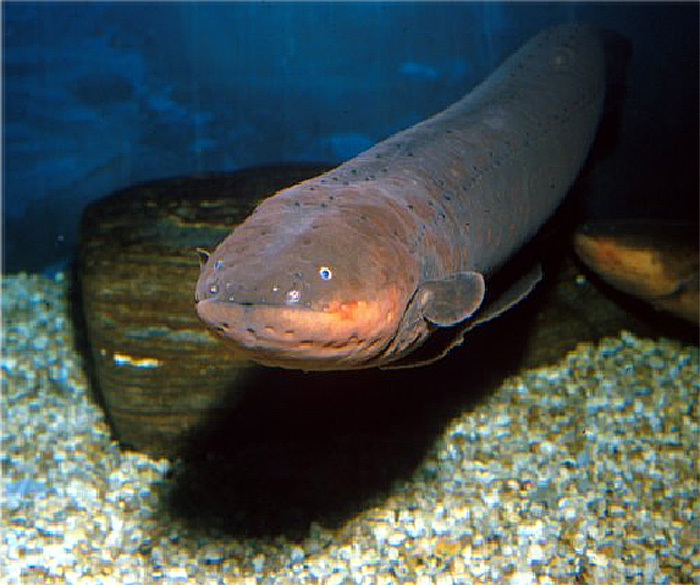 Electric eels are not true eels, they are only eel-like in shape. Despite its name it is not an eel at all but rather a knifefish. They tend to live on muddy bottoms in calm water and are obligate air-breathers; rising to the surface every 10 minutes or so, the animal will gulp air before returning to the bottom. Nearly 80% of the oxygen used by the fish is taken in this way. This indicates that it is a more likely candidate for having a variation that lives on land. However an environment like the Gobi Desert would seem particularily harsh for such a creature. However remember the local belief that "the worm likes to get out on the ground generally after the rain, when the ground is still wet". Electrophorus electricus is famous for its ability to produce strong electrical currents, reaching 500-650 volts. This strong discharge is used to stun or kill prey. This electrical discharge is also used to ward off potential predators. Up to 6,000 electroplates are arranged like a dry cell in the eel's body. Its internal organs are all in a small area behind the head, with 7/8 of the eel being tail. The electrical shocks come from muscles mainly in the tail portion of the electric eel's body. The body of an electric eel is similar to a battery. The tail end of the eel has a positive charge and the head region is negatively charged. When the eel touches its tail and head to other animals it sends electric shocks through their bodies. When the eel is at rest, there is no generation of electrical impulses. Although all living creatures generate bio-electricity all known creatures that produce electricity useful for navigation, communication and for attack/defence are water dwelling creatures. No known electric eels can emit poison. Could it be a Spitting Snake? Maybe the creature is a kind of spitting cobra. Spitting cobras are extremely accurate at distances over 10 feet. When the cobra wants to "Spit" or "Spray" its venom at a threat, it "Hoods Up", aims its open mouth as specialized muscles contract the Venom Gland, forcing the Cobra's Venom out through it's fangs. The Cobra is well equipped to spray its painful venom directly into the eyes of potential trampling animals from a safe distance. Snakes are wormlike shaped just like the reported "Mongolian Death Worm". 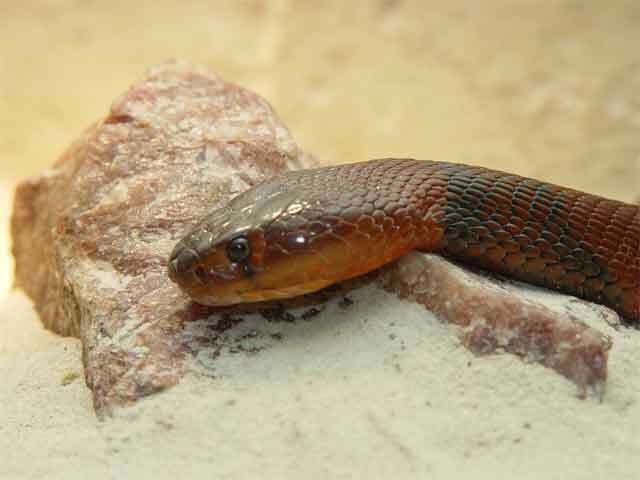 Some spitting cobras are reddish in color-similar to reports about the Mongolian Death Worm. Perhaps the stories about the electricity charges were made up or mistakes caused by the surprise of seeing the creature. 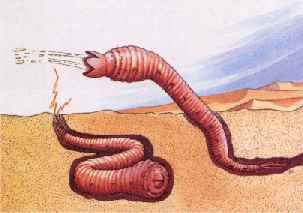 Could the Mongolian Death Worm be the result of a powerful thoughtform magickally created to protect secrets of a lost ancient civilization which once existed in the Gobi Desert? There could be as yet undiscovered, burial grounds, caves tunnels, magikal items, lost treasure, ancient scrolls and advanced technology which is being protected under the inhospitable sand and rocks of the Gobi Desert. Phonetically, the word Gobi means "very large and dry" in the Mongolian language. It occupies an arc of land 1,300,000 square km in area, making it one of the largest deserts in the world. Contrary to images often associated with a desert, much of the Gobi is not sandy but is covered with bare rock. "Gobi or Shamo Desert A wild, arid region of mountains and sandy plains which was once fertile land and in part the site of a former inland sea or lake on which was the "Sacred Island" where the "Sons of Will and Yoga," the elect of the third root-race, took refuge when the daityas prevailed over the devas and humanity became black with sin. It has been called by the Chinese the Sea of Knowledge, and tradition says that the descendants of the holy refugees still inhabit an oasis "in the dreadful wildernesses of the great Desert of Gobi, now the fabled Sambhala" (SD 2:220). This region was transformed into a sea for the last time ten or twelve thousand years ago; a local cataclysm drained off the waters southward and westward, leaving the present conditions. It is also said that the events connected with the drying up of the Gobi region are associated with allegories of wars between the good and evil forces and the "systematic persecution of the Prophets of the Right Path by those of the Left" which led the world into materialistic forms of thought."